Health and Safety Law Poster A3 FWC30/A3 Pack of 1 All old versions of the HSE poster should have been updated by April 6th 2014. Features a unique serial number and hologram. 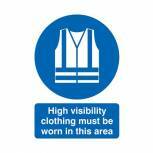 Informs workers and employers how to follow H and S policy. Gives guidance on how Health and Safety law affects your workplace. 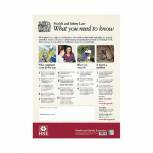 New Health and Safety Law Poster A2 FWC30 Pack of 1 The Health And Safety Law Poster. If you employ five or more people, you have a legal duty to inform employees of their rights and obligations under health and safety law. Size: 595x415mm. 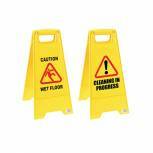 Caution Folding Safety Sign Yellow 101423 Pack of 1 All plastic folding safety sign. Yellow with a message in red and black. Printed both sides. Caution Wet Floor and Cleaning in Progress. 300x630mm. 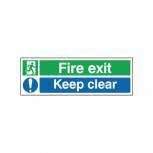 Safety Sign Fire Exit Keep Clear 150x450mm Self-Adhesive EC08S/S Pack of 1 UK's leading sign manufacturer. Universal symbol for the emergency fire exit. Clearly indicates Fire Exits to be kept clear. Self-adhesive vinyl. Size: 150x450mm. 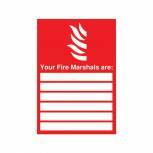 Safety Sign Your Fire Marshals A4 PVC FR09850R Pack of 1 UK's leading sign manufacturer. Space to fill in your site's information. Instantly recognisable to users. Professional and informative. Details your sites fire marshals. Size: A4. 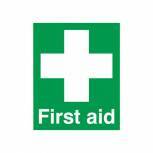 Safety Sign First Aid 100x250mm PVC FA00607R Pack of 1 Instantly recognisable to users. Indicates first aid points and equipment. Durable PVC can be fixed to walls, doors and other surfaces. 100x250mm. Green and White. 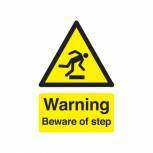 Safety Sign Warning Beware of Step A5 Self-Adhesive HA21451S Pack of 1 Self-adhesive sign warning of potential trip hazards. Universal symbol and colour scheme. Keep employees informed to prevent accidents. Self-adhesive backing - no need for tools. Reads: 'Warning Beware of Step'. Size: A5. Colour: Yellow and Black. 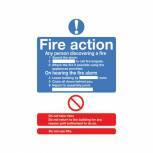 Safety Sign Fire Action Standard A5 Self-Adhesive FR03551S Pack of 1 UK's leading sign manufacturer. Universally recognisable. Displays procedures to follow in the event of fire. Professional and informative. Details fire safety instructions. Self-adhesive vinyl. Size: A5. 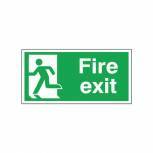 Safety Sign Fire Exit Running Man Arrow Left 150x450mm PVC FX04311R Pack of 1 UK's leading sign manufacturer. Universal symbol for the emergency fire exit. Widely recognisable and clear. Professional and secure. Clearly indicates Fire Exit. Size: 150x450mm. PVC. 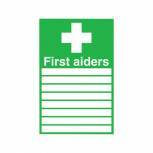 Safety Sign First Aiders 300x200mm PVC FA01926R Pack of 1 Space to fill in names, phone numbers and locations of first aiders. Keep employees informed in case of accidents. Durable PVC. Dimensions: 300x200mm (HxW). Colour: Green and White. 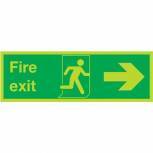 Safety Sign Niteglo Fire Exit Running Man Arrow Left 150x450mm PVC FX04311M Pack of 1 UK's leading sign manufacturer. Universal symbol for the emergency fire exit. Widely recognisable and clear. Glows in the dark. Clearly indicates Fire Exit in light or dark rooms. Size: 150x450mm. 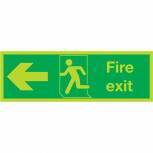 Safety Sign Niteglo Fire Exit Running Man Arrow Right 150x450mm PVC FX04411M Pack of 1 UK's leading sign manufacturer. Universal symbol for the emergency fire exit. Widely recognisable and clear. Glows in the dark. Clearly indicates Fire Exit in light or dark rooms. Size: 150x450mm. 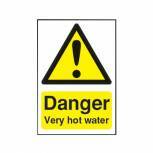 Safety Sign Danger Very Hot Water 75x50mm Self-Adhesive HA17343S Pack of 1 Self-adhesive sign warning of very hot water. Universal symbol and colour scheme. Keep employees informed to prevent accidents. Self-adhesive backing - no need for tools. Reads: 'Danger Very Hot Water'. Dimensions: 75x50mm. Colour: Yellow and Black. 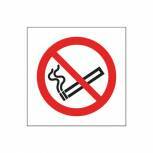 Safety Sign No Smoking Symbol 100x100mm Self-Adhesive (Pack of 5) KP01N/S Pack of 5 UK's Leading Sign Manufacturer. Universal symbol. Professional and informative. Indicates no smoking area. Self-adhesive vinyl. Size: 100x100mm. Pack of 5. 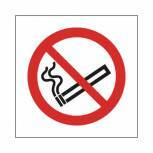 Safety Sign No Smoking Symbol 150x150mm Self-Adhesive P01G/S Pack of 1 Self adhesive, vinyl sign - no smoking - large symbol. Size: 150mmx150mm. Safety Sign Fire Exit Keep Clear 150x450mm PVC EC08S/R Pack of 1 UK's leading sign manufacturer. Universal symbol for the emergency fire exit. Clearly indicates Fire Exits to be kept clear. Size: 150x450mm. 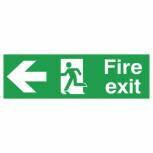 Safety Sign Fire Exit Running Man Left 150x300mm Self-Adhesive E96A/S Pack of 1 UK's leading sign manufacturer. Universal symbol for the emergency fire exit. Clearly indicates Fire Exit. Self-adhesive vinyl. Size: 150x300mm. 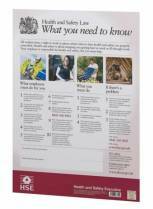 Health and Safety For Computer Operators Poster 420x594mm FAD129 Pack of 1 Health and Safety for Computer Operators FAD129. Encapsulated finish for superior durability. 420 x 590mm. 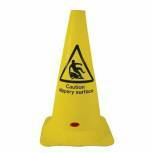 SYR Caution Wet Floor Hazard Warning Cone 21 Inches 992387 Pack of 1 Cylindrical safety cone for wet surfaces. Caution Wet Floor message with warning symbol. Highly visible, yellow plastic. Made from strong PVC. Square base for stability. Height: 21 inches.